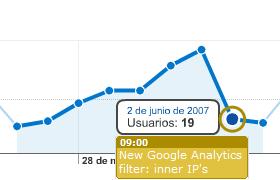 I think it’s not possible to create this association externally since Google Analytics has no API. 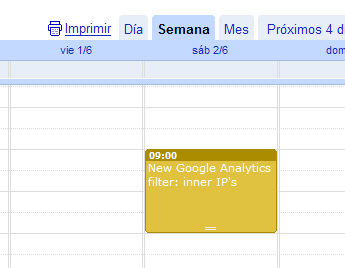 This could be only a first step, but there are many other possibilities: for instance, create events automatically from Google Analytics! Great idea. But it could be difficult to use it, because GA account can be viewed by many people (you can grant access to GA to other people), but Calendar is owned only by you. You can have shared calendars, but when someone want to see GA stats, the application should check if that person has access to your shared calendar. For me, it look easier for GA to have his own calendar, and grant access to the GA user to that calendar. So you can have in your own calendar the shared GA calendar. It is a nice feature to have in mind, like a log of changes you made on your website.